Efficient blues-rock endeavor from same Way International label that produced Pressed Down Shaken Together, Good Seed, Joyful Noise, Miles Of Smiles and Paul Virgilio. Features Lepinski on piano, backed by a small rock combo. Skips from straight-ahead contemporary blues-rock to boogie to slow blues ballads to retro Fats Domino r&r grooves with suave sax lines. No downer vibes here as the music and lyrics all have an upbeat optimistic mood – is that allowed on a blues record? Good rockin’ guitar on the title cut, ‘Brand New Life (Ain’t No Doubt About It)’ and ‘Since I Found The Way’. Gets pretty comical with his over-dramatic Elvis impersonation on ‘Nobody Knew’. Harmonica joins the picture on the closing boogie number ‘Truckin’. 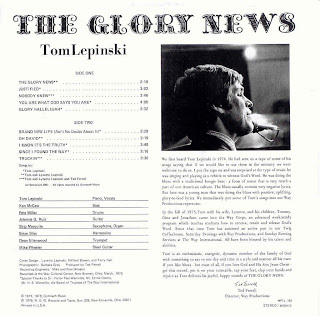 All ten songs written or co-written by Lepinski. 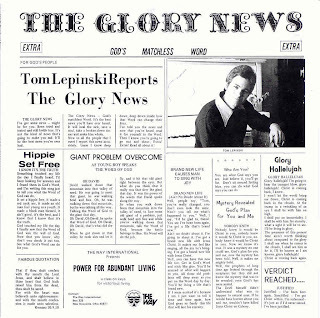 Black and white cover is patterned after the front page of a newspaper, with headlines like Hippie Set Free, Giant Problem Overcome and Verdict Reached. (The Archivist, 4th edition by Ken Scott). Don’t know this guy but will give it a try…..
Are you the brother of Tim Lepinski from Novato CA? I just was wondering how he was.